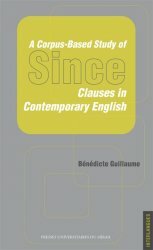 Format et nombre de pages : 13,5 x 22 cm - 208 p.
This book is concerned with the characteristics of the two categories of since- clauses in contemporary English (namely, causal vs. temporal), based on an in-depth analysis of more than 500 attested examples sampled from the British National Corpus. Although these two types share the same introducing subordinator, they are often contrasted with each other regarding their position in the sentence, or in terms of the choice of tense, aspect and modality in the main clause and in the since- clause respectively. Nonetheless, the recourse to since may give way to semantic ambiguity, which makes it necessary not only to re-examine its etymology, but also to keep an open mind as far as grammatical classification is concerned. Although an utterercentred approach is favoured, all the technical terms used in the present study are defined and contextualised, making it accessible to anyone interested in English grammar and/or (corpus) linguistics. Bénédicte Guillaume is a senior lecturer at Univ. Nice Sophia Antipolis and a member of the CNRS, BCL, UMR 7320 research team. She teaches grammar and linguistics in the Department of English Studies and has published articles dealing with various aspects of the English language as well as a book on English question tags.